I was delighted to receive a copy of a couple of Tracey Todhunter's books recently. The book I'm reviewing today is called Crochet Learn it. Love it. with the description 'Techniques and projects to build a lifelong passion, for beginners up'. Although I have been crocheting almost as many years as I have been knitting, my crochet skills haven't really progressed much beyond granny squares and in recent months, some of Lucy Attic24's blankets. I first came across Tracey last year when she offered to donate a couple of her books as prizes in my Great Yarn Giveaway. (I can't believe that was a whole year ago!) Tracey, who blogs over at GrannyCoolCrochet, is a well-known, popular crochet designer with more than 20 years of experience teaching crochet, so I felt I would be in very safe hands. The book is divided into five very comprehensive chapters: Essential Skills, Working in the Round, Stitch Patterns, Finishing Touches and Taking Your Skills Furthers. Within each chapter, there are some really lovely projects so you can have a go at practising your newly acquired skills, as well as a Be Inspired page with links to other patterns. I loved this feature as it showed you what you could achieve with your new skills. In the final chapter, Taking Your Skills Further, Tracey introduces you to Tunisian crochet, Hairpin crochet and Broomstick crochet, so it really is an excellent book, not only for complete beginners, but also for crocheters who want to improve their skills. I know that it's going to be a very useful addition to my bookshelf. Crochet. Learn it. Love it. by Tracey Todhunter is published by Search Press and is available now. Stylecraft has just released the last of their new yarns for the Spring and Summer collection. I should really say new colours rather than yarns as they are adding to the colourways in two popular collections. Four new colours have been added to the Stylecraft Special DK range. I've used this yarn to make blankets and I love it. Soft, easy to care for, long lasting and economical. There are now more than 90 colours in the range - we are so lucky that Stylecraft keep adding colours and not discontinuing any in this range. The colours are: Cornish Blue, Powder Pink, Toy and Spearmint. They are all now available from bricks and mortar shops and online stockists. Powder Pink is a very delicate, soft pink colour and goes beautifully with the other pinks in the range. Toy came about because of requests from toy makers. It's a fairly neutral colour that will work very well alongside brighter ones. Lastly, Spearmint is a more pastel version of Aspen I think, but still quite fresh looking. I believe that my fellow Blogstar Lucy from Attic24 is using some of these new colours in her latest blanket, Dune, which will be released very soon. So check out Lucy's blog to see how they work alongside some of the existing colours. The other yarn range which has been added to is Wondersoft. This is a very soft yarn for babies and children. I've used it recently to knit some baby clothes and the recipient couldn't believe just how soft it was. It certainly lives up to its name! Firstly Merry Go Round has three new colours. From left to right, these are Fruit Salad, Blackcurrant Bonbon and Seaside Rock. The yarn knits up in a self striping way and is perfect for easy care baby knits. Also added to the Wondersoft range are two colours of Wondersoft Prints. These knit up to give a Fair Isle effect, so you can impress people with your stranded knitting look without any of the hassle of knitting with multiple balls of yarn. 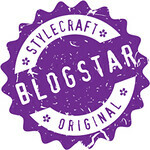 Stylecraft Blogstars Get Together aka Yarnaholics have fun in Yorkshire! Last weekend I was in Slaithwaite, home of Stylecraft yarn, to catch up with the other Blogstars and find out what yarny treats Stylecraft had in store for knitters and crocheters around the globe. Some of us arrived on Friday afternoon and spent some time looking through Stylecraft's pattern archive. There were lots of real classic, timeless designs there as well as a few shockers! It shows how fashions change. It's Stylecraft's 30th birthday or 'Purl Anniversary' as they are calling it in 2019. There are going to be lots of exciting things going on this year which I'll tell you more about in due course. We were joined by some of the other Blogstars who arrived a little later and spent Friday evening being wined and dined in a most marvellous manner by Annabelle and Juliet; and yes - knitting and crochet did appear at the dining table! It's normal for us when we get together! We made our way down to the Mill on Saturday after breakfast, to be joined virtually by our overseas Blogstars. We always begin with tea and a catch up. Lucia had brought along her amazing Havana blanket - made with a huge variety of different yarns. It is absolutely stunning and I think we would all have liked to take it home with us! 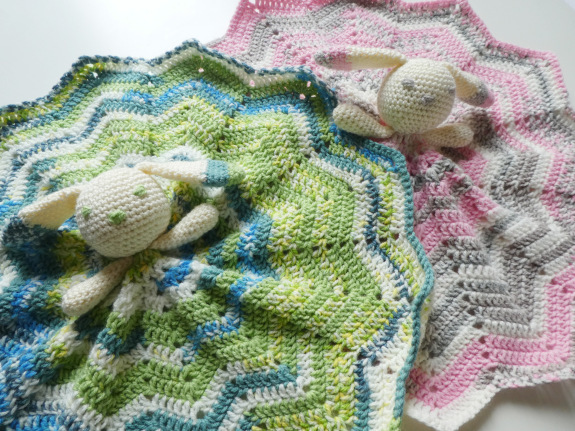 As well as her Havana blanket, Lucia also brought along her January Blues blanket; you can find out a lot more about it if you head over to her blog. Be prepared for an absolute feast of colour! She made it using leftovers of Stylecraft Special DK, so it's a perfect project for using up all those half-used balls of yarn! Phil also brought along her AMAZING knitted pond picture. It it seriously breathtaking and must bring into question Phil's sanity! (Only kidding!) You can read a lot more about it and see more detailed photos on Phil's blog. After our catch up, Annabelle then took us through the new yarns that Stylecraft are bringing out over the 2019 Spring/Summer Season. Because our February meet up was postponed by the weather, many of these yarns are already in your local yarn shops. This season has been inspired by two moodboards. Tribal Eccentric features a soft and strong vibrant colour palette with a playful, exuberant and energetic feel while Radiant Romance features a soft palette of pastel colours to create feminine garments with drape and fluidity. The first yarn is Dream Catcher, a roving type yarn with gradual colour changes. There are currently 6 colourways available. It's 90% acrylic and 10% wool and is unbelievably soft. Lucia had already crocheted the Havana shawl using two different colourways alternately and it was amazing to see how the two worked so beautifully together. There are four new shades in the Bambino yarn range. It's 100% acrylic and perfect for baby clothes and blankets. It has a lovely soft, plump, velvety feel to it. There are two new shade of Jeanie. This is an Aran weight yarn, 60% cotton and 40% acrylic. I think that Jeanie will work well with one of the new yarn releases this season. More of that in a minute! Classique Cotton is very popular with crocheters and there are six new colours to play with. I love these beautiful soft, chalky shades. Lucia has been trying some of them out in a new blanket and they look gorgeous. Monet is a new Aran weight yarn, 50% acrylic and 50% cotton, inspired by the Impressionist paintings. Looking at the finished garments, you can really see the dots and brushstrokes of the likes of Monet and Renoir. I think it would also go very well with Jeanie. Moonbeam is another new yarn this season. Made of 75% cotton and 25% viscose, it has a matt or shiny effect depending on which section of the yarn you're looking at. I think it will be perfect for lovely draping shawls and wraps. Last but not least for now is one of my favourite of Stylecraft's yarns - Linen Drape. There are four new shades to add to the existing range. They are all beautifully rich and deep colours. After a delicious lunch, we were taught how to make a simple sewn notebook by Juliet Bernard. It was a fun way to conclude the day and my notebook is now residing in my knitting bag, ready for me to scribble down ideas and design notes. I'm a teacher by day, but my spare time is filled with knitting, spinning, crochet and sewing. I live in rural Norfolk in a house well insulated with yarn and fibre, together with my darling yarn-loving cat, Florence! Following the sudden death of my lovely Mr JK in 2016, I am learning to live alone. I hope you enjoy reading about the goings on chez josiekitten! Visit josie's profile on Pinterest. Blogs I love to visit! gilly makes . . .